Speyside is Scotland's most prolific whisky regions, with the vast majority of the country's distilleries. As far as Speyside is comcerned, think honey on malt - the style Speyside is most known for. Contents of the set are subject to change. 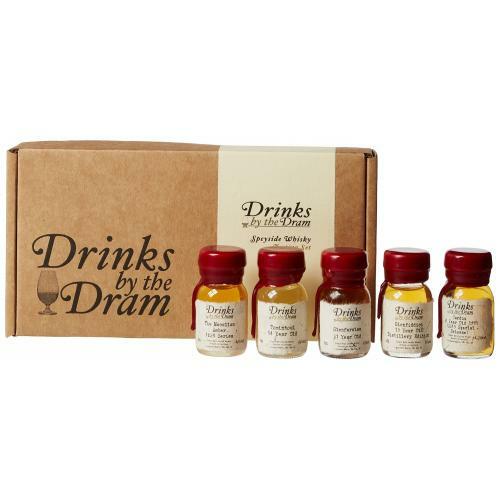 However, rest assured that whichever dram set you order will include 5 superb drams which will either match or exceed the value of what is listed. Nose: Sugary biscuits, baked apple and crushed nuts feature on the nose as well as delicious fudge and a herb hint. Palate: Rich and full with spicy notes of cinnamon sticks and oak. Then there's vanilla, raisin and biscuit-y notes paired with dark jam while elements of the nose continue onto the palate as well. Finish: Warm and drying with cinnamon, pepper and vanilla. Nose: Intense, full of aromas – sherried fruit, tropical fruit, nutmeg and almonds with slight citrus notes at the end, all held together with a vanilla sweet smokiness. Nose: Delicate and very subtle, honeyed-cream with a light floral malt, hints of wild fennel and a complex sweetness. Palate: Elegant, round, soft and gentle. Dry oak vanilla and a clean malt with some creamy sweetness and barley. Finish: Long and creamy with proclivity to dryness & a slight peppery tone. Nose: Zesty grapefruit and baked toffee apples dominate followed by chocolate Flake-y wood and cinnamon. Palate: Candied fruits and Glenfiddich freshness balances richer notes of dried apricot, more cinnamon and toffee, ginger and dry Sherry. Finish: Peels and a touch of salted toffee. Nose: Soft aromatic vanilla, lemon and barley with hints of ginger. Chocolate is also present with hints of Sun-Maid Raisins. Palate: Surprisingly thick and fruity in comparison to the nose. Sultanas, dates, apple peelings and a hint of cinnamon. Cereal notes are then joined by mince pies with crumbly shortbread. Finish: Fragrant oak finish, with the mince pie notes lingering.